MotoArt, the company that turns vintage aviation parts into stunning fixtures for the home and office, is now back with the 747 Jet Liner Bed. 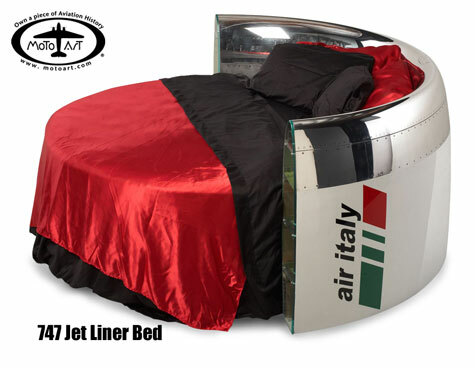 This bed has been made using an authentic 747 engine nacelle cowling as the headboard. Round beds were popular in the 60’s and are now making a comeback, as they are a refreshing alternative to the rectangular bed. Using an authentic 747 engine nacelle cowling as the headboard, MotoArt combines an 84″ diameter round mattress and box spring for a perfect fit. This well traveled engine nacelle makes a very comfortable headboard and arm rest combination.